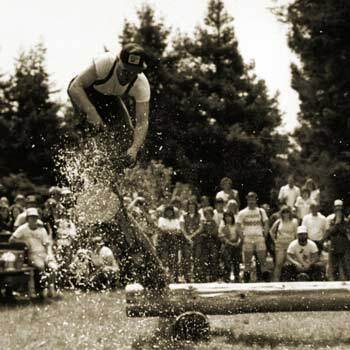 1983 seniors demonstrate double-bucking at Lumberjack Days. 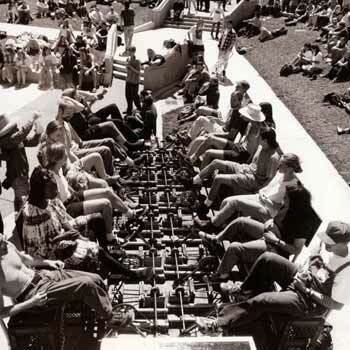 Students pedal to provide power to speakers to play music on the quad in this human energy conversion project. 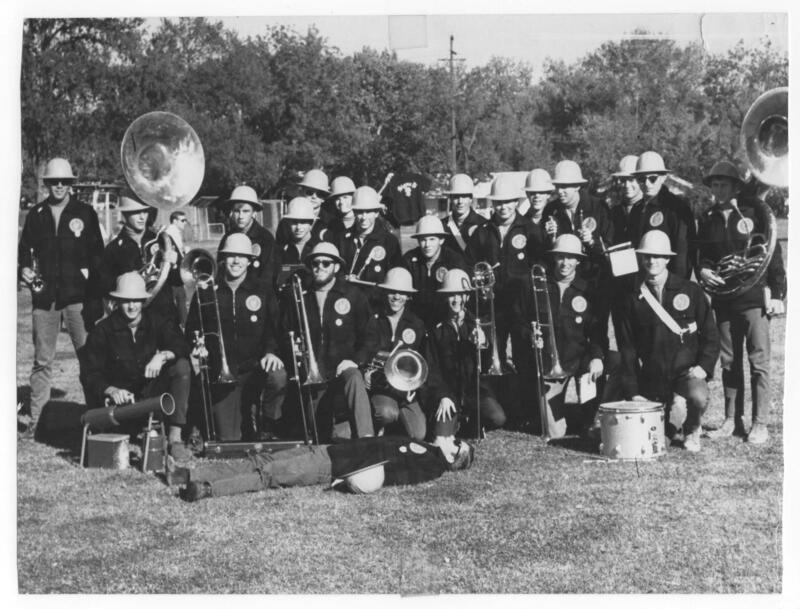 The marching band of the 1950s wore plaid backwoods machinaws and hard hats. The hard hats still remain today. 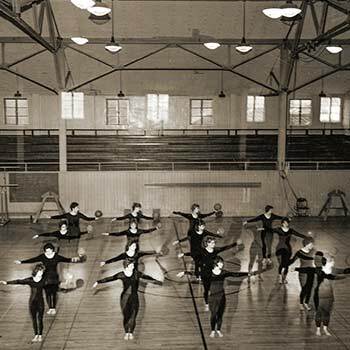 In this undated photo, students practice with the ball during a rhythmic gymnastics course. In the 1950s, gymnastics performances were featured during basketball and football halftime shows. 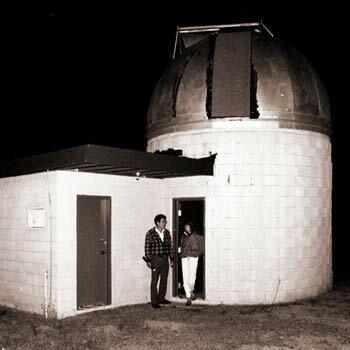 Humboldt State added an observatory to its facilities in 1971 with the donation of a 60-acre site from three alumni as part of the Astronomers of Humboldt County Club. Located on Fickle Hill road, the observatory originally housed a 12.5-inch reflecting telescope. Today students access two 14-inch telescopes and six 8-inch telescopes with computer control and astrophotography capacity. 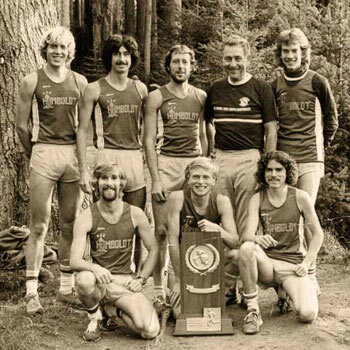 The 1980 cross country team is seen with the National Championship title trophy. Coach Jim Hunt, back row, second from the right, coached the team from 1965 until his retirement in 2008. 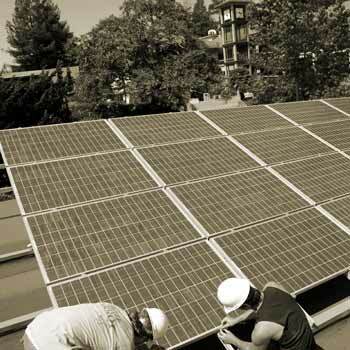 A student initiative, the Humboldt Energy Independence Fund pays for student-designed clean energy projects on campus. 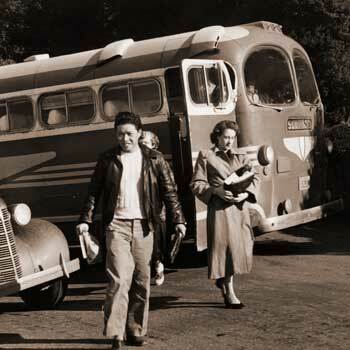 During World War II, travel was restricted and gasoline was rationed, putting a serious damper on intercollegiate competition. 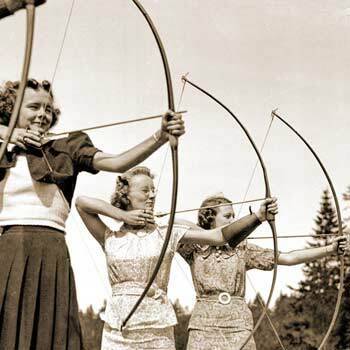 In a 1944 women’s archery tournament, the results were tallied and mailed to officials. 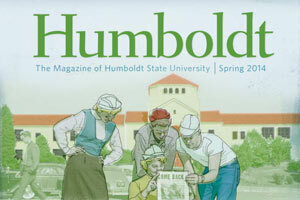 Humboldt placed fourth in a field of 24 colleges, all competing by mail. The Archery club is still active, holding twice-weekly practices in the Field House. 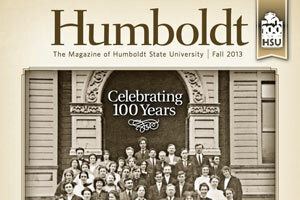 Humboldt State and Chico State have been rivals going way back. This is the axe that went to the winner of the yearly football game. 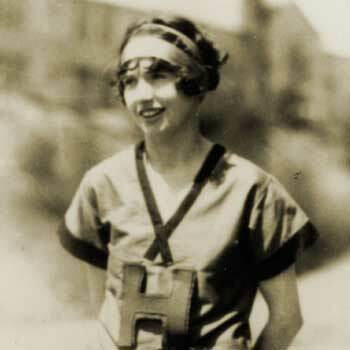 Elta Cartwright set records as a runner for Humboldt's women's track team and in 1928 she was on America's first women's Olympic team, competing in Amsterdam. 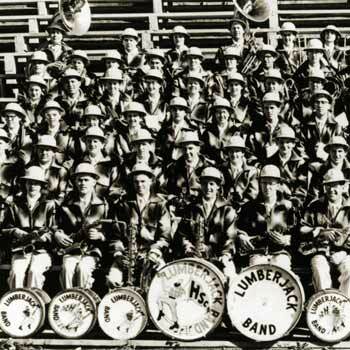 The World-Famous Marching Lumberjacks circa 1968, submitted by Larry Puterbaugh. Larry is fifth from the left on the first row. 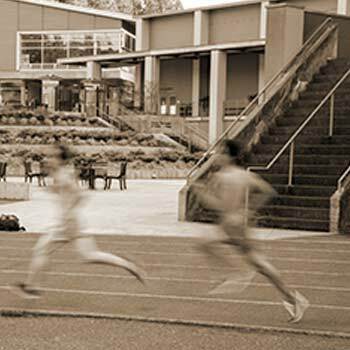 Track & Field student athletes practice on HSU's track, made from recycled rubber. In 2008 campus completed the Kinesiology & Athletics Building, which along with the Redwood Plaza, has brought a new look and feel to Redwood Bowl. In this view from Founders Hall, the west side of campus is visible. 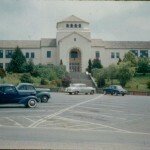 The old library, erected in 1962, appears in the background. In front of Siemens Hall is a patch of grass where today a large heather planter sits. 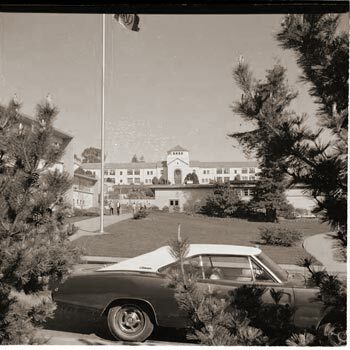 Founders Hall is seen from the library in this 1973 photo. 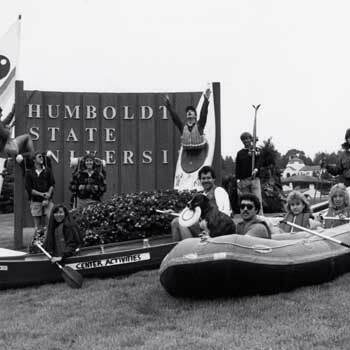 This undated photo shows a College Lyceum trip from Humboldt State College to Santa Rosa. 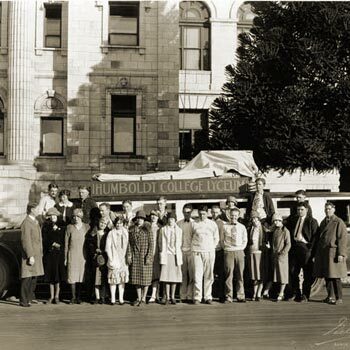 Humboldt’s Lyceum, named for the famed classroom of Aristotle, traveled throughout northern California to bring music and dramatic entertainment while also serving recruiting new students. 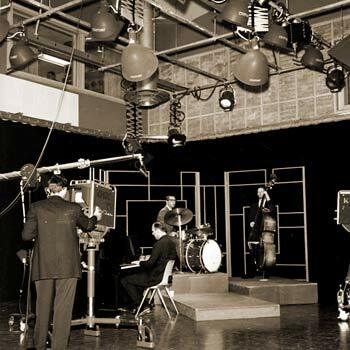 The group was later known as the Collegians. Center Activities provides classes in outdoor, aquatic, and leisure activities for students. Students hit the books in a simple, yet functional, residence hall room. To the right, a student uses a slide rule on his coursework. Slide rules remained popular on campus through the 1970s, when the introduction of the pocket calculator spelled the demise of the nearly 400-year-old calculation tool. What is currently the campus events field originally functioned as a baseball diamond. 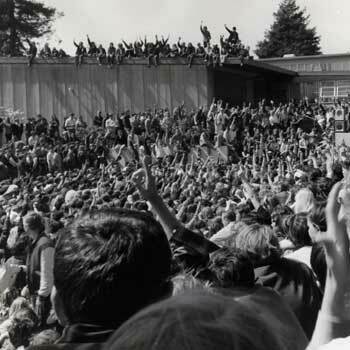 Men’s baseball was played on campus through the early 1980s when budget constraints and new regulations from Title IX led to a reorganization of university athletics. 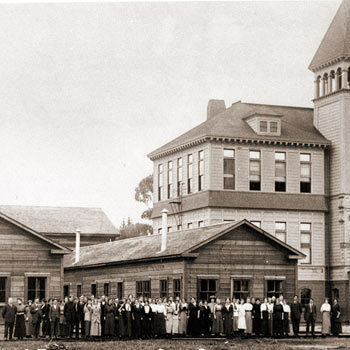 In this 1914 photo, the original faculty and students of Humboldt State Normal School pose in front of the school's original location at Arcata's 11th and M streets. To the right, stands Arcata Grammar School. 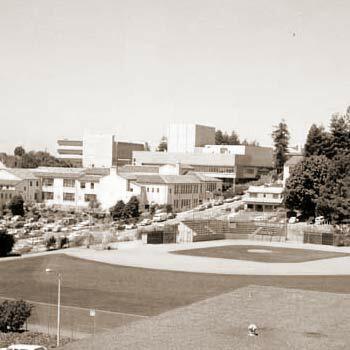 Softball was a popular sport on campus. 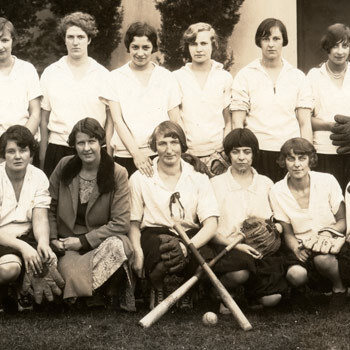 Women's intramural sports also included volleyball, field hockey, basketball, track and field, archery, and golf. 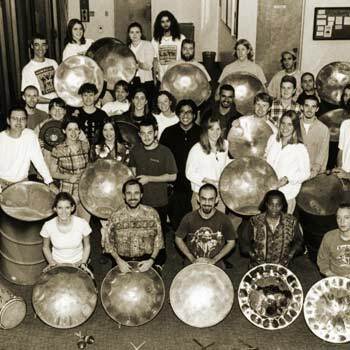 Humboldt's Calypso Band was created in 1986 to showcase the traditional and contemporary music of the Caribbean, Africa, Brazil and the United States. 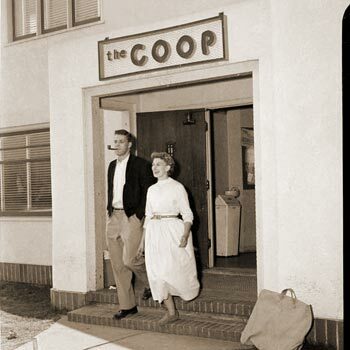 This undated photos shows an entrance to the COOP, the campus’s former supply store and soda fountain. 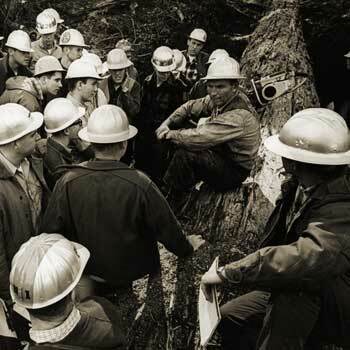 Environmental Science was a part of HSU early on. Some of these antique microscopes can be found on the second floor of the library today, in the Robert Paselk Scientific Instrument Museum. In 1919, vocational training was a part of a normal school education. 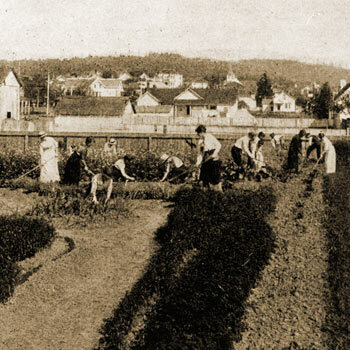 Included in this were agriculture, horticulture, domestic science, manual training and music. 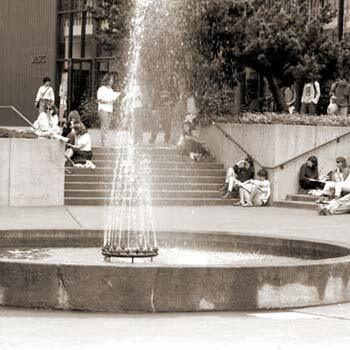 The old fountain on the art quad is seen in this 1989 photo. The fountain was the subject of a 1999 masters thesis by alum Jensen Rufe ('99, Theatre, Film and Dance) titled "The Ugliest Fountain in the World (Without a Doubt)." 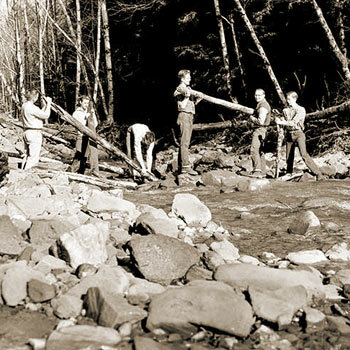 In this photo, taken in 1955 or 1956, members of HSU's Wildlife Society chapter work on a stream restoration project. The group, known as Conservation Unlimited, is still active on campus. 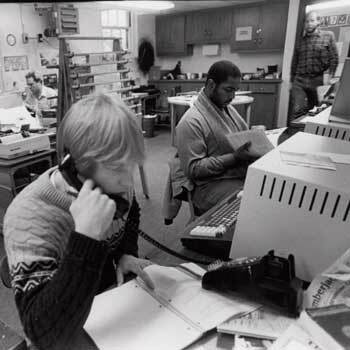 Staff members prepare for the 1984 Humboldt Orientation Program. 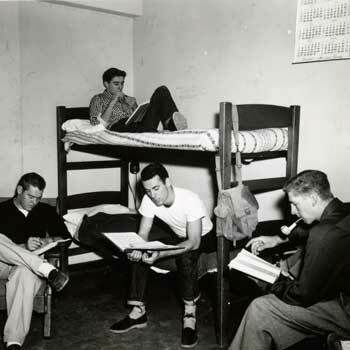 By 1955, campus leaders deemed it necessary to hold a Frosh Camp to orient freshmen before fall classes. Now known as the Humboldt Orientation Program, it covers everything from major planning and registration, to health and safety and more. 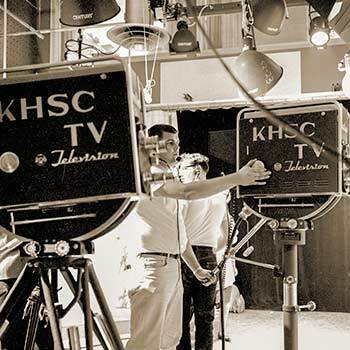 This photo, probably from the early 1960s, shows students engaged in the KHSC Television workshop. 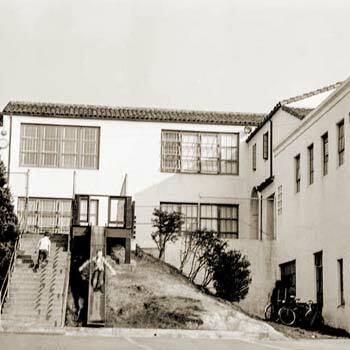 Broadcasting began on campus in partnership with KIEM radio, then located in the Vance Hotel in Eureka's Old Town. 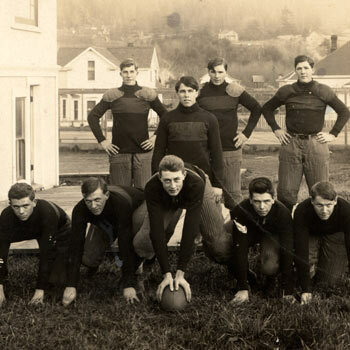 In a small new school like Humboldt, every available male was shanghaied to provide enough members for a football team. 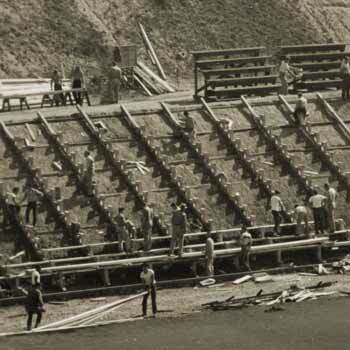 The bleachers were built by students with community support in 1947 as part of the yearly Work Day, where students cleaned and worked on the campus. 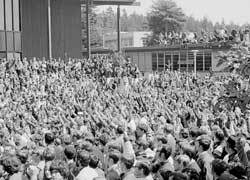 3000 students and faculty voted for a one week "Strike for Peace" to protest the invasion of Cambodia in 1970. The flight cage at the game pens allows students first-hand observations of bird behavior. 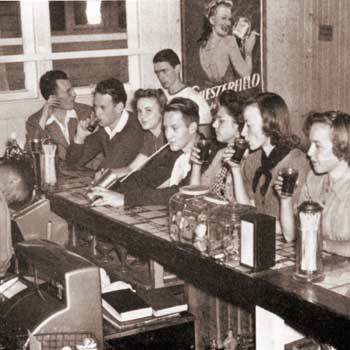 The Co-op was a combination book store and fountain where students could chat with friends and get a soda. 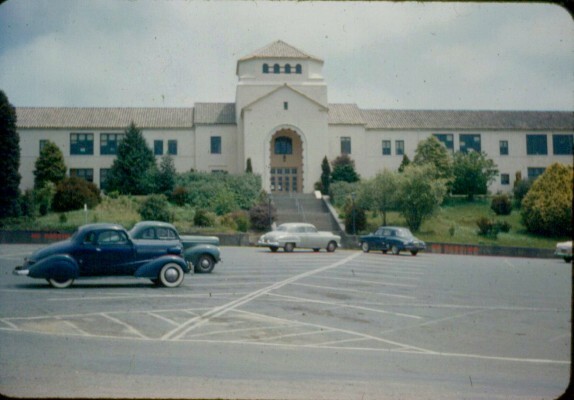 Replaced by the Student Union in the 1960s. 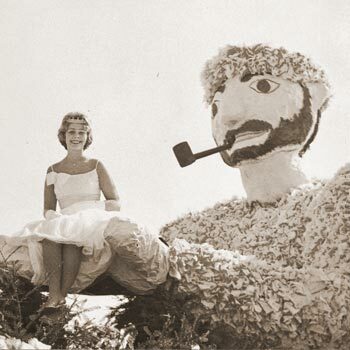 Homecoming Queen Linda Arvola on a lumberjack float during the parade in 1962. 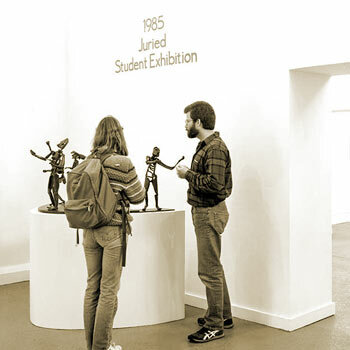 Students look at pieces displayed during HSU's annual Juried Student Exhibition in 1985. The show, which has been recast as the Art Graduates exhibition, takes place every April and May. The new exhibition gives all senior students the opportunity to present their work. The Lumberjack is the school's student run newspaper. 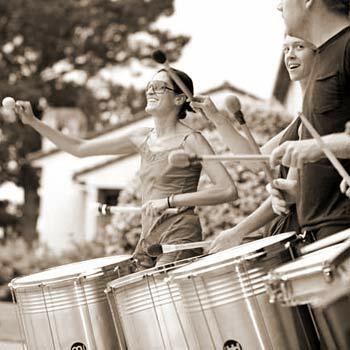 Members of HSU's Percussion Ensemble perform Brazilian samba music on the quad in this 2010 photo. 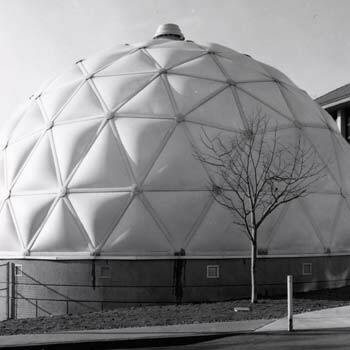 The geodesic dome greenhouse was created in 1983. Today Humboldt has the largest, most diverse greenhouse in the state university system with 1,000 species and 180 plant families growing. 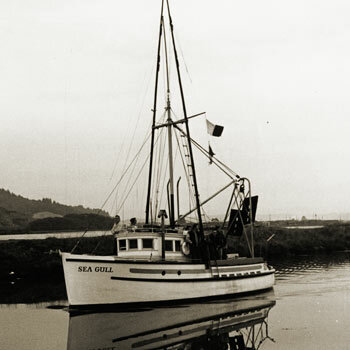 The Sea Gull was the first in a long line of ocean research vessels owned by HSU. The current vessel, the Coral Sea has been in service since 1998. 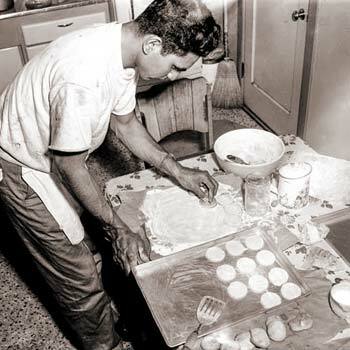 In this undated photo a student cuts out cookies as part of a Home Economics course. 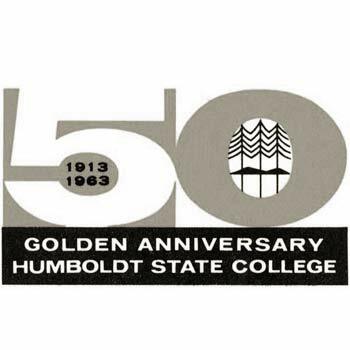 Bachelor's degrees in Home Economics were offered at Humboldt State as early as the 1920s. Considered an applied science, home ec. was offered on campus until 1990. 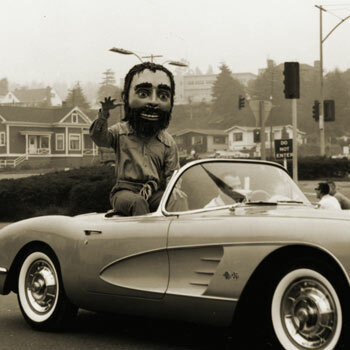 Lucky rides in a convertible in the 1962 Homecoming parade. 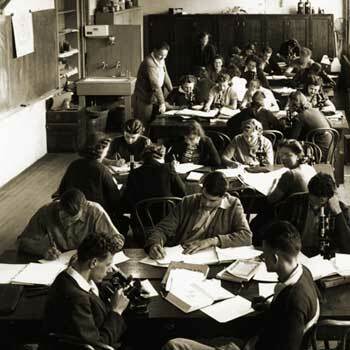 Chemistry classes were required for future high school and physical science teachers. 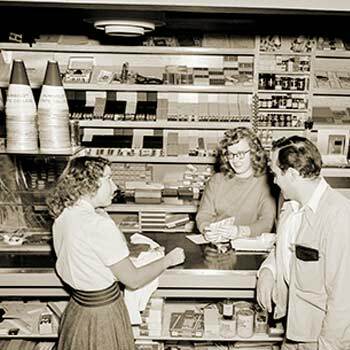 The Co-op was the campus outlet for school supplies and refreshments before the construction of University Center, where you can find the HSU Bookstore today. 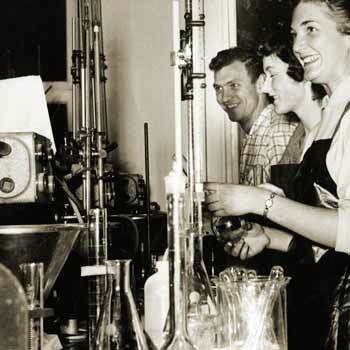 At the Co-op, students could buy everything from Humboldt State memorabilia to photo developing chemicals and a soda. 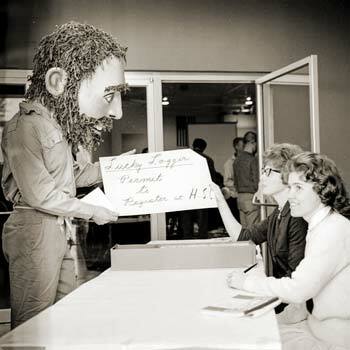 Lucky Logger, registration ticket in hand, takes part in registration day in this undated photo. 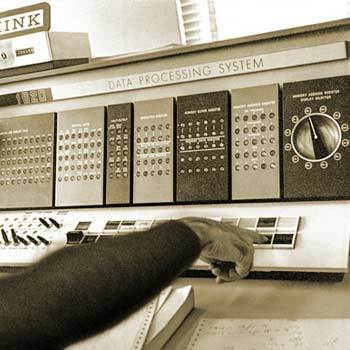 In 1958, registration began its march toward automation with the introduction of an IBM punch card data processing system. Even with the punch cards, long lines snaked through the gym as students waited to register in person. Today, students register anywhere they can find an internet connection. The Jolly Giant Commons were under construction in the late '60s and opened in 1968. The work didn't end there: In 1997 the facility was remodeled and upgraded for earthquake safety. An espresso bar was also part of the retrofit. 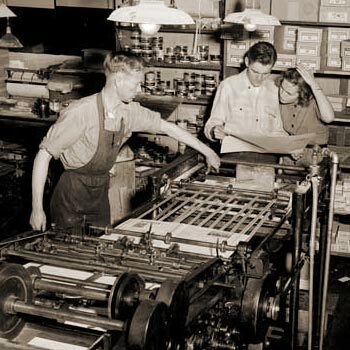 The old printing presses that produced the Sempervirens yearbook, among other things, is seen in this 1958 photo. 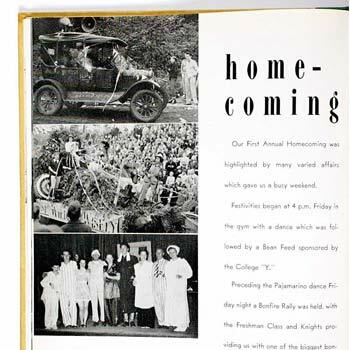 The yearbook was published through the end of the 1960s when campus attitudes changed. 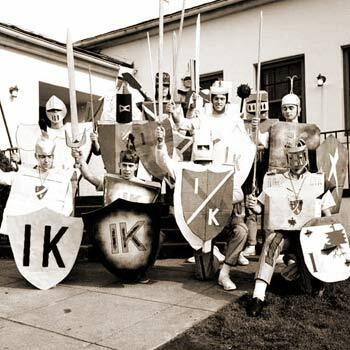 At this same time the final fraternities on campus dissolved and the campus began selling beer and wine. 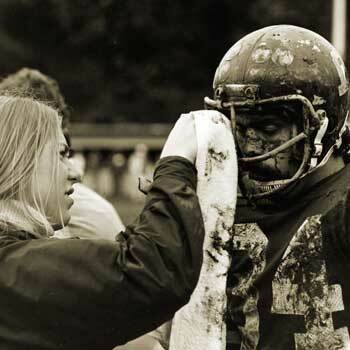 A muddy football player in 1977. The Redwood Bowl field is now artificial turf so muddy messes like this no longer occur. 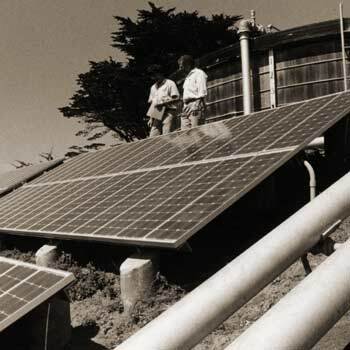 Some of the first solar panels appeared on the Marine Lab in Trinidad, supplying electricity to the lab. The tennis team poses for this undated photo in the old tennis courts. 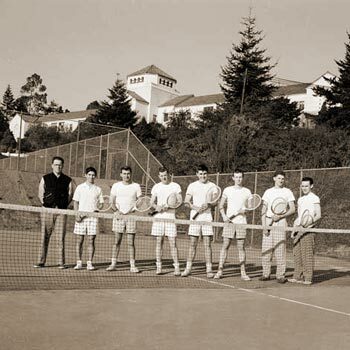 Humboldt State fielded men’s and women’s tennis teams from the 1930s through the 1960s. 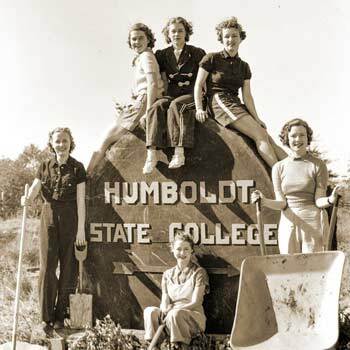 Students pose for a photo by the old Humboldt State College sign. 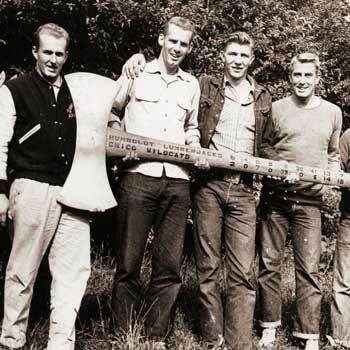 The sign, made from a single redwood round, was likely donated by a local timber company. The students were participating in a campus Work Day, which included students and faculty cleaning windows, removing clutter, weeding, repairing roads, cleaning classrooms and more. At the end of the day, students enjoyed a free bean feed and a faculty show of spoofs and skits. 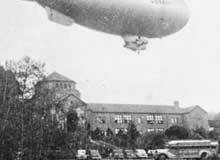 Built in 1933, the College Elementary School, now Gist Hall, featured a slide on the building's south side. What's now a parking lot between the Student & Business Services Building was formerly playground blacktop. 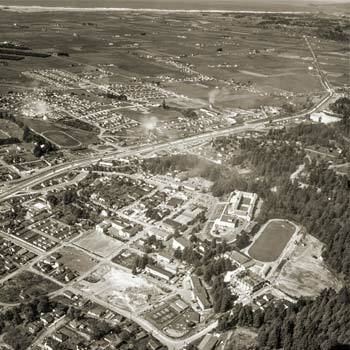 Metro bus service started in Arcata in 1962. 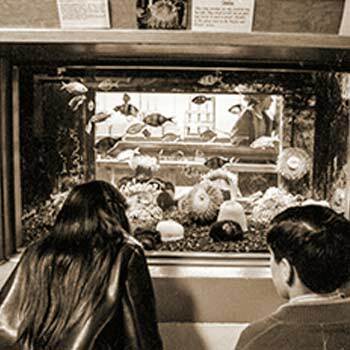 Visitors get a closeup look at marine organisms in a display tank at Humboldt State's marine laboratory in Trinidad, Calif. 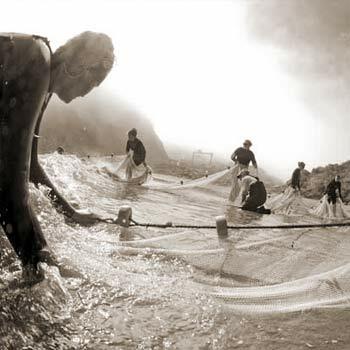 The lab, which opened in 1966, was constructed originally as a Fisheries Laboratory and expanded in 1974. 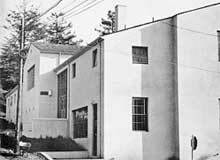 In 1979 it was dedicated as the Telonicher Marine Laboratory, after a longtime Humboldt State Professor, Fred Telonicher. In 2011 a major renovation further expanded the lab's visitor and research facilities. 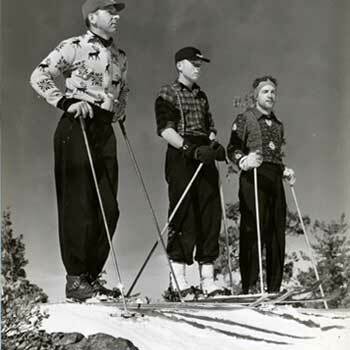 The Humboldt Ski club dates back to 1939. The Lumberjack Clubhouse cabin was off Highway 299 on Horse Mountain. 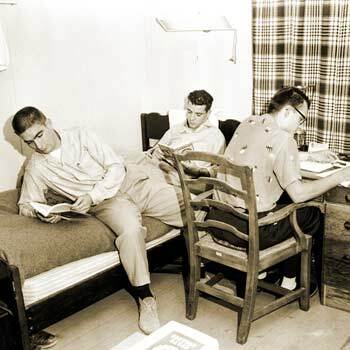 Students studying in a dorm room in 1953. 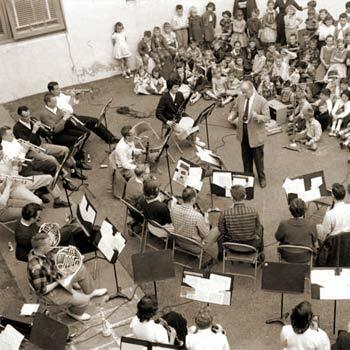 Humboldt State music students perform for area school children in this undated photo. 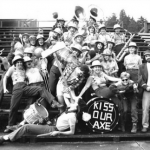 Field trips to the Arcata campus for concerts and theatre performances have been a tradition for local children for decades. The Marching Lumberjacks take the field during halftime in Redwood Bowl. The field, muddy in this shot, was replaced by artificial turf just before the 2011 football season. 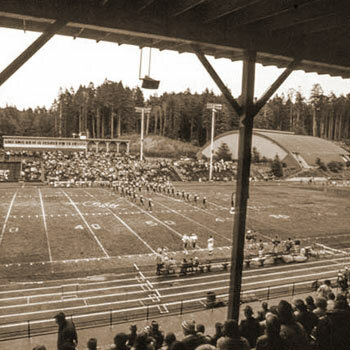 Prior to the construction of Redwood Bowl, Humboldt State played most of its home games in Eureka High School’s Albee Stadium. 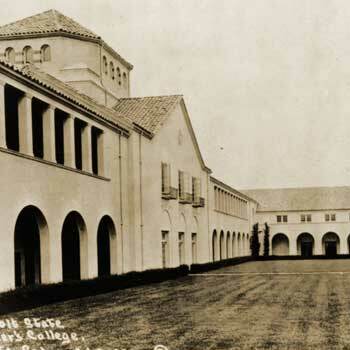 That changed when former director of Athletics and head football coach Joseph Forbes arrived in 1946. 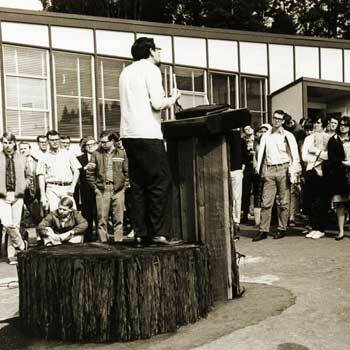 In the 1960s the speakers stump was a common fixture on campus where students voiced their opinions to the student body. 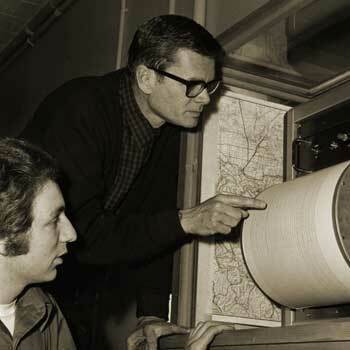 The first seismograph on campus in the south end of Founders Hall. 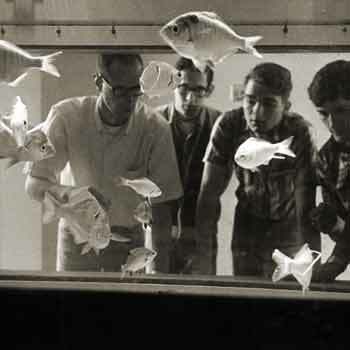 The Fred Telonicher Marine Lab was created in 1966 to provide oceanfront classrooms for instruction. 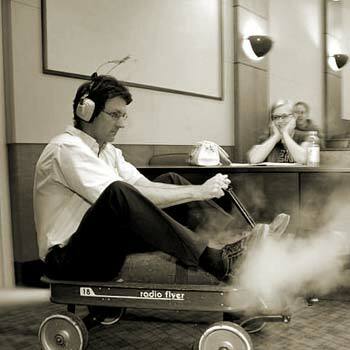 Physics professor Wes Bliven demonstrates the power of compressed gas with his rocket-powered vehicle. Engaging faculty in courses like Physics 106 are what sets Humboldt State apart from other schools. 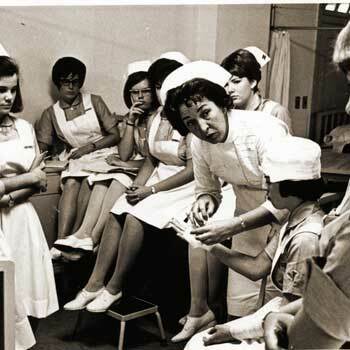 Pre-professional nursing classes had been offered since 1935 and in 1958 a nursing program bagan to create registered nurses. 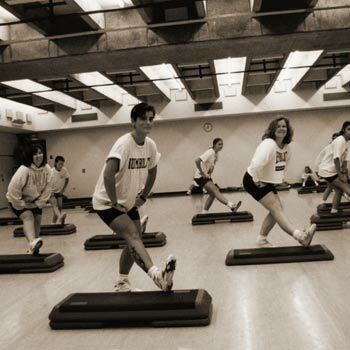 An aerobics step class put on by the physical education departement in 1994. 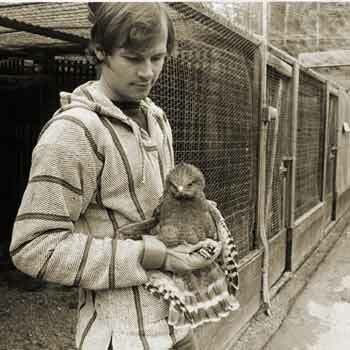 William Lanphere and his wife taught the first wildlife management courses at HSU in the 1940's. 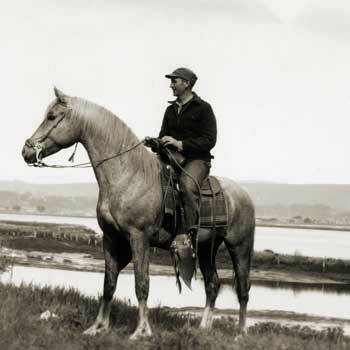 William pictured here on horseback on what would become Humboldt Bay National Wildlife Refuge. Senior life sciences major Leigh Manley studies a harbor seal pup at Abalone Beach near Patrick's Point, north of Trinidad. 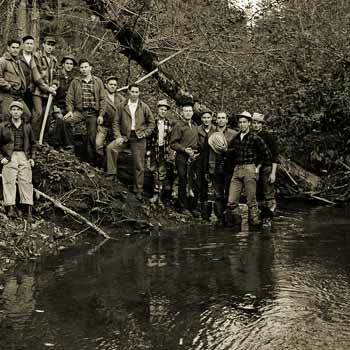 In 1954 members of the Conservation Unlimited Club took part in a stream clearance project on Grassy Creek. 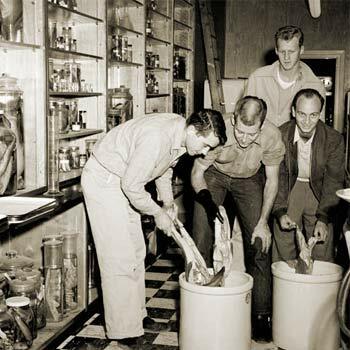 Students prepare specimens in this undated photo. Today the Timothy E. Lawlor Mammal Collection contains more than 15,000 specimens, including some rare and exotic specimens like a platypus, tarsier and more. 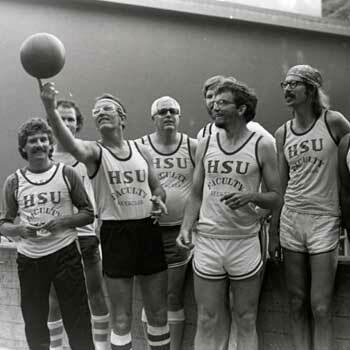 HSU Faculty used to have their own basketball team. 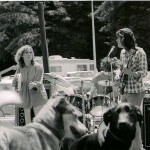 Photo from 1984. Forestry students out on a field trip talking to local timber faller. 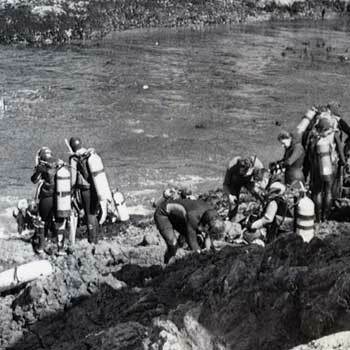 Scuba diving is offered to HSU students. Photographed here in 1995. 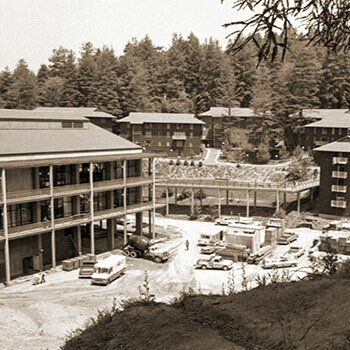 Funds of $245,000 produced a grand new building for the Humboldt State Teachers College as the name Normal School passed from use. 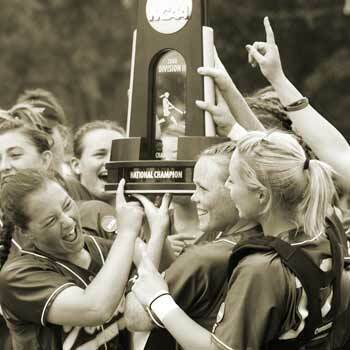 HSU softball has a long history of Championships including a national championship in 2008. 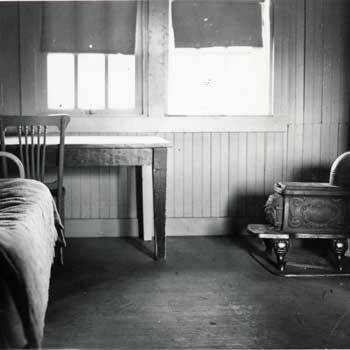 The first library at HSU was located in Founders Hall. 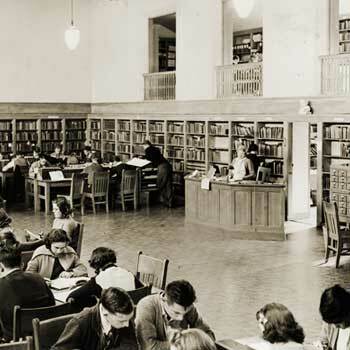 The library did not receive it's own building until the 1950s. 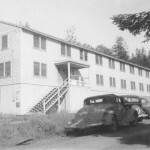 The dorms for the school where located where Nelson Hall now stands. Rent was $7.50 a month. 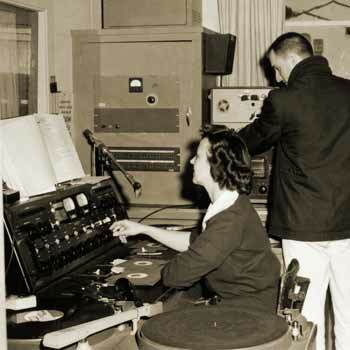 KHSU was the first college state radio station in California. Created in 1960. 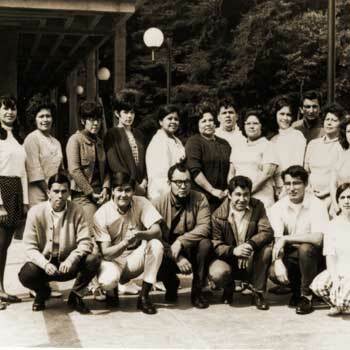 The Indian Teacher and Educational Personnel Program began in 1969. Created to bolster Native American teachers in Northern California. 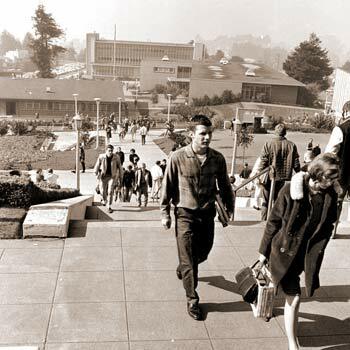 A thoroughly modern look was chosen for Humboldt State’s 50th anniversary in 1963. 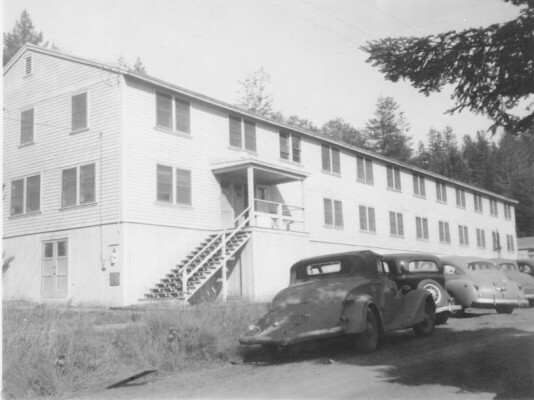 Dormitories at Humboldt went coed in 1969. 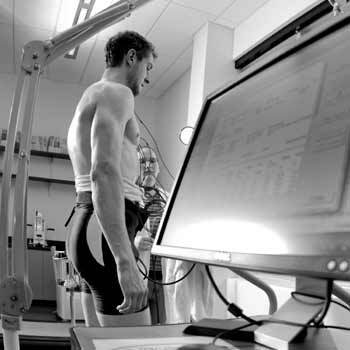 A new kinesiology and athletics building opened in 2008 which includes the Human Performance and Biometrics lab. The Friendship Macintosh Computer Lab. IBM punch cards were used for registration in 1958 and computerized registration made it's way to campus in 1968. 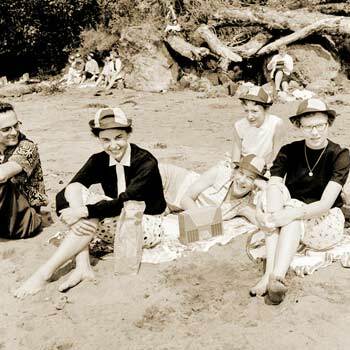 Students relax during a summer picnic in 1955. 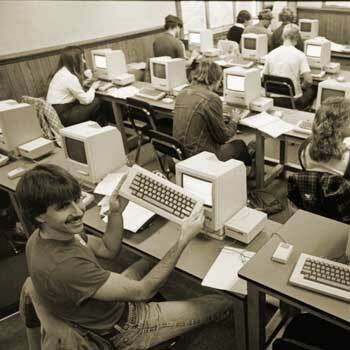 This undated photo shows an early campus computer. Computerized registration and grades keeping arrived in spring 1958. Today, of course, computers are an essential part of the student experience and Humboldt State offers a major and minor in Computer Science. 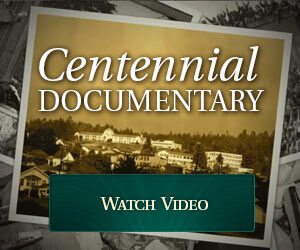 Humboldt State University celebrated its Centennial Year in 2013-14. This site is no longer being updated, but is retained as a resource. 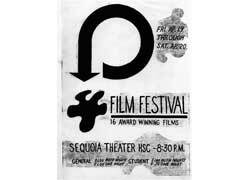 Inaugural Humboldt Film Festival is held. Currently, it's the longest running student-lead festival of its kind. Wells Fargo donates it's former building, which then becomes home to HSU Natural History Museum. 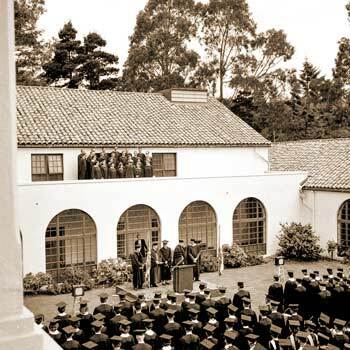 Students adopt the “Graduation Pledge,” which reads, “I pledge to explore and take into account the social and environmental consequences of any job I consider and will try to improve these aspects of any organizations for which I work.” Universities worldwide have since adopted the pledge. Athlete and alumnus Mark Conover ('81, Natural Resource Planning & Interpretation) wins the marathon at the Olympic Trials and competes in the Olympics in Seoul, South Korea. 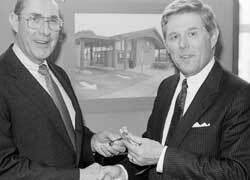 Conover is inducted into the Humboldt State Athletics Hall of Fame in 1993. Humboldt State Museum of Natural History Opens. Private donors and foundations from the community worked together to convert the former bank building, which had been donated by Wells Fargo. Campus dedicates the 125-foot Pacific Hunter as a research vessel. The ship, a gift from the Gib Hunter and Eureka Fisheries, Inc, was originally commissioned as a Coast Guard Cutter in 1927. Women's intercollegiate crew and soccer teams established. HSU is among the first in the CSU to meet the standards of a 1993 agreement between the Cal State system and the National Organization for Women, which calls for more equitable representation and funding between male and female sports programs. Students vote 3-to-1 against adopting the Marbled Murrelet as school's mascot. 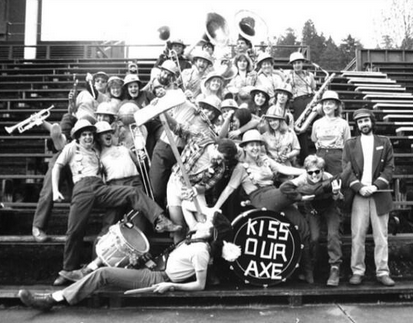 The Lumberjack has been the school's official mascot since 1936, when it replaced the Thunderbolts. Marine Wildlife Care Center established to care for oiled seabirds in the event of spills along the North Coast. First Street Gallery opens in Eureka. Thousands of HSU Art students have since gained first-hand experience in museum and gallery practices. Researchers from the Schatz Energy Research Center debut country's first street-legal hydrogen powered car, the Neighborhood Electric Vehicle. Dr. Rollin Richmond succeeds Dr. Alistair McCrone to become Humboldt State's sixth president. 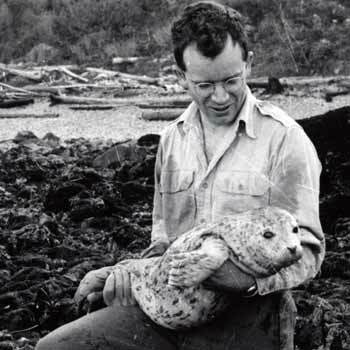 Alumnus Ken Fisher establishes the Kenneth L. Fisher Chair in Redwood Forest Ecology. It is the first named chair at Humboldt State and the first endowed chair in the world to support the study of a single tree species. Dr. Stephen C. Sillett is the first to hold the endowed chair. The 84,000-square-foot Behavioral and Social Sciences Building opens. It's the first building in the CSU system to earn a LEED® gold rating—the second highest rating bestowed by the U.S. Green Building Council. The student-designed Hydrogen Fueling Station debuts, connecting HSU to California's Hydrogen Highway. A pair of modified Toyotas comprise the hydrogen-powered fleet. The Kinesiology & Athletics Building opens. The $44 million project includes a new pool, classrooms, offices and labs. Lumberjacks fans can now cheer on their teams in the spacious 17,655 square-foot gymnasium, which can seats 2,000. 2012 Women's Rowing team wins its first NCAA Division II National Championship. 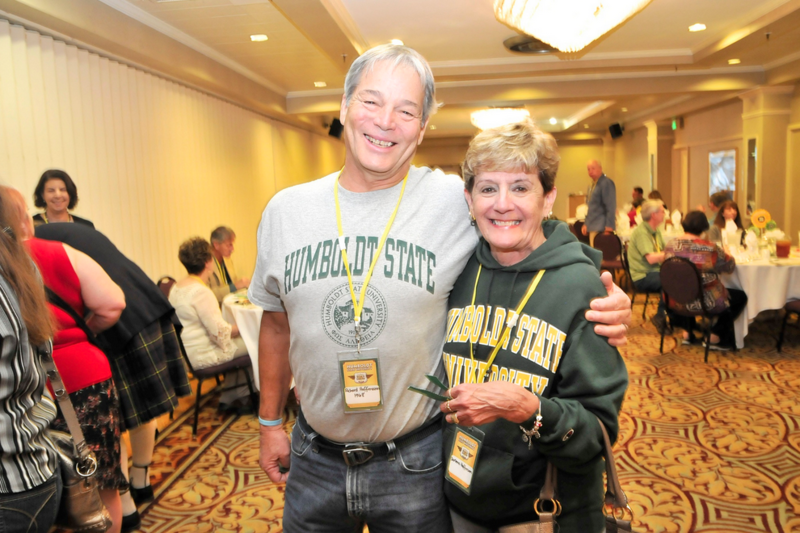 The HSU Alumni office has recently wrapped up their final Centennial Roadshow for the Fall 2013 season. We have visited alumni in over 11 different cities around the US including but not limited to; Walnut Creek, La Jolla, Monterey, Redding, Anchorage AK, Portland OR, Fresno, Denver CO, Montclair NJ, Boise ID and Bend OR. Who in the world was Alexander von Humboldt? 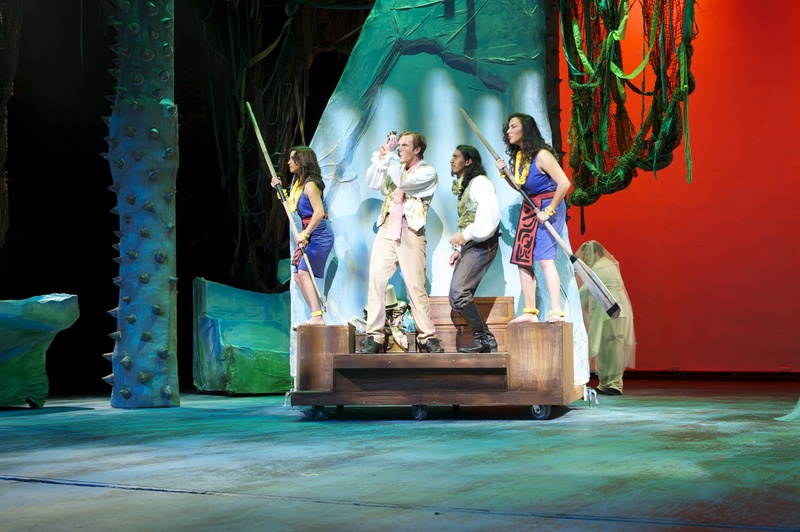 During Humboldt State University’s centennial year, this original play about the school’s namesake attempts to capture the spirit of his life as visionary explorer, scientist, godfather of ecology and champion of diversity and freedom. Download a PDF calendar of all upcoming events. 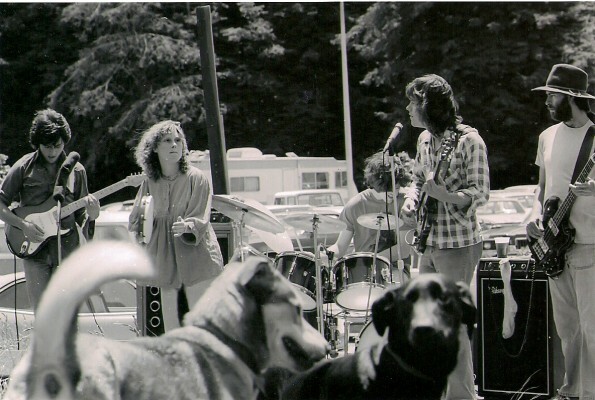 Memories shared, from alumni and friends of Humboldt State. If you want to add your own photo memories to the collection, submit them here. The Centennial Speaker Series is sponsored by HSU's College of Natural Resources & Sciences, College of Professional Studies, and College of Arts, Humanities and Social Sciences, and in part by gifts from HSU alumni and friends to the Humboldt Loyalty Fund. We'd like to thank our Centennial sponsors. 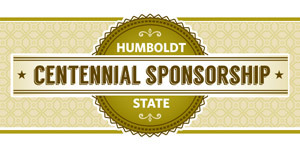 If you'd like to sponsor Humboldt's Centennial download the sponsorship form. Special thanks to Blue Lake Casino for sponsoring the 2013 Homecoming & Family Weekend and HealthSPORT for sponsoring our Founders Day event. 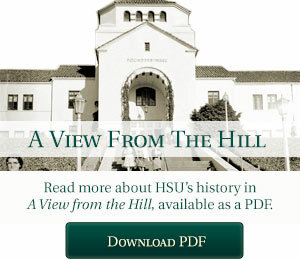 Nearly all the historical facts and photos on this website are available due to the efforts of Joan Berman and others in HSU’s Humboldt Room; former HSU History Professor William Tanner who authored the comprehensive campus history View from the Hill (available in the University Library); and HSU alumna Katy Tahja who authored the recent photo history titled Humboldt State University (available from the Humboldt Alumni Office).